Taking a cue from Pinterest, our family kept a travel journal over the course of our trip to England which we went on earlier this year. Already that journal has come in handy as I'm piecing together a scrapbook of the trip. It's amazing how quickly you can forget the little details which stood out and made the days memorable. I'm so glad that we took notes as we went along (even if we didn't manage to keep up the pace and document the entire trip - the first half is soundly recorded!). When we returned home I saw this Kids' Travel Journal from Peter Pauper Press and I was so curious to check it out! I was kindly sent a copy for review. If you have some kids on your Christmas list that you know will be traveling in the coming year, you might (definitely) want to consider this book. I've peeked at a few travel journals and none appealed to me so much as this one did, which I do think is rather practical and which I plan to take along with us on our next adventure. The following information is essential for the person doing the packing: the dimensions of this journal are 8.4 x 6.1 x 0.6 inches. It's big enough for lots of notes and information to be included in it but thin enough not to be a bear in the suitcase or backpack. It is a hardback book but I think that's fairly important for a travel journal which you hope will hold up under the weight of travel. All in all, I find it to be a manageable size and I don't have any hesitations in deciding to pack it. I like the fact that this Kids' Travel Journal opens with several pages for pre-travel experiences. There are prompts to get the child to think about where they are going and what the plans are when they get there. There is also a page available to write down what the child would like to see and do while on the adventure which is pretty sweet. Sometimes kids will surprise you in revealing what is most important to them about any given trip. Personally, we think it's a great idea to get input from all family members so that you can better plan a trip which is enjoyable for all ages and interest and this page is remarkably useful to that end. There are, of course, some pages which I find to be rather impractical and which I can't see us using but that's to be expected in any pre-arranged journal, I think. For instance, I'm not so sure that I'd fill out the pages which allow you to write out your itinerary (which one shall we set aside as a "sick day"?) but those more concerned with sticking to the plan might still enjoy that feature. I also wouldn't list out the "important contacts" on the off chance that the book would get lost but, again, others might find that useful. Do note that this book allows for a 14-day excursion. Depending on what type of trip you'll be on, you will want to consider that. The later section of the book includes puzzles and games to keep the user occupied which is a clever idea. Those types of pages keep the journal in the hands of the user, encouraging interaction and documentation. There is also what I would call a "trip in review" section where the writer is encouraged to talk about the most memorable aspects of the trip as well as document any unique experiences had when returning home. 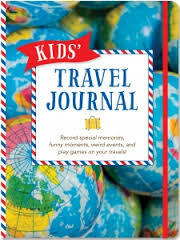 Really, if I were going to gift a travel journal to a child, the Kids' Travel Journal would be the one. It's far and away the most useful kids' journal I've run across, with plenty of space to write one's thoughts out and writing prompts that are appropriate, intelligent and helpful. I'm definitely a fan. This makes for a fun and also practical gift to anyone planning a vacation in the coming year. Just a note to keep it in mind! Many thanks to Peter Pauper Press who kindly sent a copy of this book my direction in order to facilitate a review. I received no additional compensation and all opinions are 100% my own.